Radiation effects can be deterministic or stochastic. Deterministic effects cause direct cell damage (radiation burns, teratogenicity, intrauterine death, genetic material damage). There is no evidence of teratogenicity in diagnostic testing radiation ranges (<50mGy). Genetic damage (causing effects in future generations) is theoretical and has not been reported. IUD is a concern, but on a population based scale there was no noted increase in incidence of fetal demise after large scale radiation event and this cannot be studied in vivo. Things to think about in the neonate with significant bleeding: did mom have any anticoagulants or hematologic disorders during the pregnancy? Did the child receive Vitamin K after birth? Tips for assessing the pediatric patient for hemorrhagic shock: HR at rest should be <180 (<150 if 1+yo). Minimal acceptable SBP is 70 +2(age in years). Monitor for cap refill. Treatment: direct pressure. Silver nitrate can help cauterize localized bleeding. IV access. Crystalloid should be bolused at 20ml/kg. Blood products should be bolused at 10ml/kg. You can give 1mg Vit K IV if neonate. Establish transport early. Initial treatment if considering bacterial meningitis: decadron 10mg q6hr (inhibits interleukin and TNF synthesis. These are usually produced in response to bacterial cell-wall components by bactericidal antibiotics). Consider CT before LP if: patient is immunocompromised, has new onset seizure, has history of CNS disease, has focal neurologic deficit, has altered mental status, has papilledema. Can still consider LP if suspect increased intracranial pressure. First give 1gm/kg of mannitol and delay LP by 20 min. Can also consider intubation or hyperventilation to help temporarily decrease ICP. Treatment recs: vancomycin 1g q12, ceftriaxone 2g q12. Add ampicillin if >50yo to cover listeria. Consider Meropenem if thinking pseudomonas. 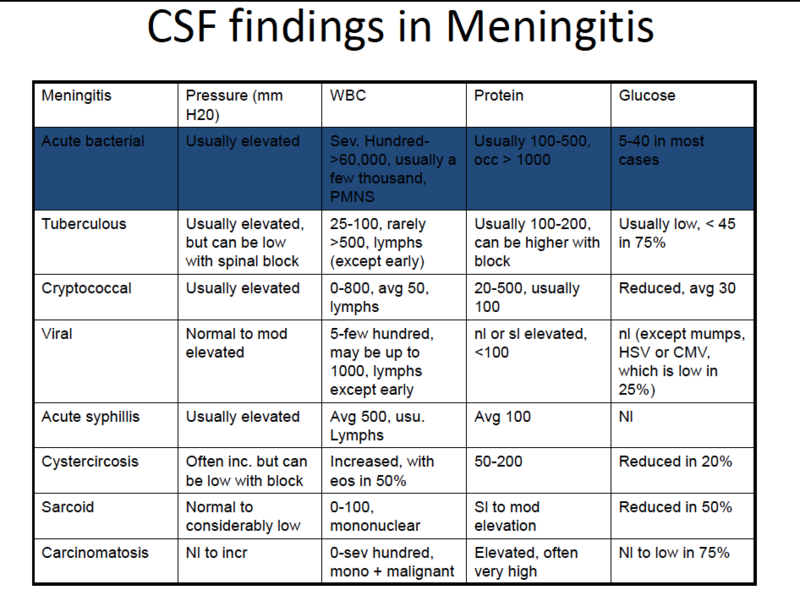 Outcomes for bacterial meningitis: 10-14% mortality. Lifelong cognitive deficits 11-19%. Tips that psychosis may be organic: recent memory impairment, hyperactive, hypoactive, tremor, ataxia, visual hallucinations, disorientation, vital sign abnormalities, sudden onset. Consider HIV and syphilis testing if first presentation of acute psychosis. Imaging studies have very low yield in psychosis but may reveal things like: caudate infarct, arachnoid cyst, moya-moya syndrome, AVM, demyelinating disease. Urine drug screens do not change ED management. In one study they changed the disposition of the patient from inpatient psych to inpatient medicine with psych consult in 3 of 110 patients. Drug self-reporting: 92% sensitivity; 91% specificity. Physical restraints may only be used to ensure the immediate safety of the patient, staff, and other patients. Patients should be frequently re-assessed and removed from restraints as soon as possible. We cannot rely on radiology completely. Approx 21% of academic facilities do not have 24hr attending radiologist over-read. Teleradiology reads can take 5-170min. SDH: width >10mm or 5mm of midline shift are indications for acute surgical decompression. Look closely at the parafalcine area to determine if SDH may be hidden there. Mass: can present with very subtle signs. May also appear hypodense on a non-con study looking like old infarct. Ischemia: look for a dense MCA (increased attenuation in proximal MCA) which may be seen within 90 min of onset. Approx 30% of NINDS patients had abnormal CT findings within 3 hours. WPW is a pre-excitation syndrome caused by an accessory pathway that can bypass the AV node. This pathway can can conduct impules in both directions in most cases. If impulse is going concomitant with normal AV conduction will get classic EKG findings of shortened PR and delta wave. If pathway only conducts retrograde (~15% of cases) may have a completely normal resting EKG but still prone to tachydysrhythmia. Tip to differentiate wide complex Afib with accessory pathway vs VTach- the axis remains stable across the EKG. Treatments include electrical or chemical cardioversion. Procainamide and ibutilide recommended as first agents if afib or aflutter. Amioderone may be used if AVRT. If unstable or chemical agents not working consider synchronized cardioversion.